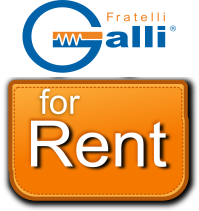 Galli offers a rental service for laboratory equipment and instruments: Ovens, Furnaces Muffle, Climatic Test Chambers, Stability Chambers, Salt Spay Chambers, Water Baths, Chillers, Thermostats, Incubators, Freezers, Scales,…. The rental of a laboratory equipment, like a Climatic Test Chamber, or Ovens, or Salt Spray Corrosion test chamber, is convenient to perform a specific test, as it does not require the initial investment of a purchase, rental could be definitely a low cost and less expensive option. The selection of Galli rental equipment and instrumentation is for all, but especially to small to medium businesses companies that initially can not manage large investments in testing and research. Where to find a rental instrument? Here at Galli, where we will be happy to advise you on the best type of equipment to use depending on your needs, so that you will have time to buy a new instrument later. Hire one Galli equipment means you always have the confidence to take advantage of a technologically advanced tool that has been tested and certified. We are available for Short Term Rental, Long Term Rental, Finance Lease, Rent with final redemption formula, always subject to availability at the time.